Mono and Stereo High-End Audio Magazine: New Eon Art Quark integrated amplifier! New Eon Art Quark integrated amplifier! 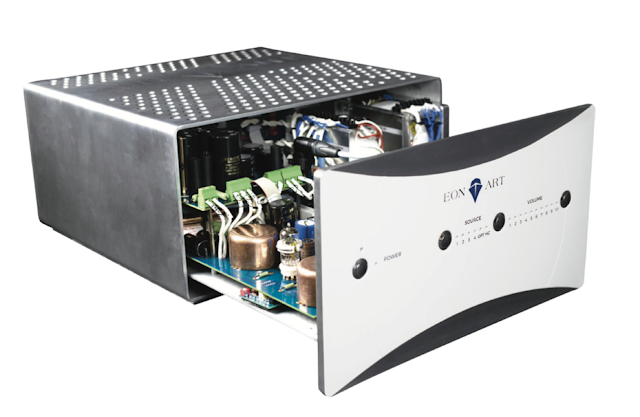 Eon Art Quark ($ 28,999 USD) is very interesting new integrated amplifier. Eon Art uses a true scientific method to design its acoustic amplifiers, converters and enclosures with a help of a custom computer for our unique optimization process, that is two hundred times more powerful than the majority of personal computers. It contains 800 cores, some of which vectorials are dedicated to artificial intelligence. "This new tool enhances our audio electronics laboratory, the largest in Canada, and allows us to manufacture high-performance products far beyond what can be achieved using traditional methods." "Our solution is unique. First, it offers the best of what transistors and tubes can mutually offer which means warmth and power. Second, the Integrated Quark has a modular card for all the usable components of the system making it the first ecologically-minded HiFi system in the world. Finally, it offers the best warranty in the industry. The Quark is a system that is scalable to all existing listening room configurations and offers full control to the user. The front panel controls are supplemented by remote control and software application. Music can be defined as emotions through sound. These emotions should be immediate and pure and the recognition of the smallest detail in the track should come naturally. This is what the Eon Art Quark amplifier is all about. We can effectively create new emotions through music as we master the elements that create sound. We truly hope this rare jewel of precision will add to your lifestyle. Eon Art and the Quark are the product and creation of Mr Stephane Hautcoeur. The research and development was started in 2008 in France and followed through in Quebec, Canada. 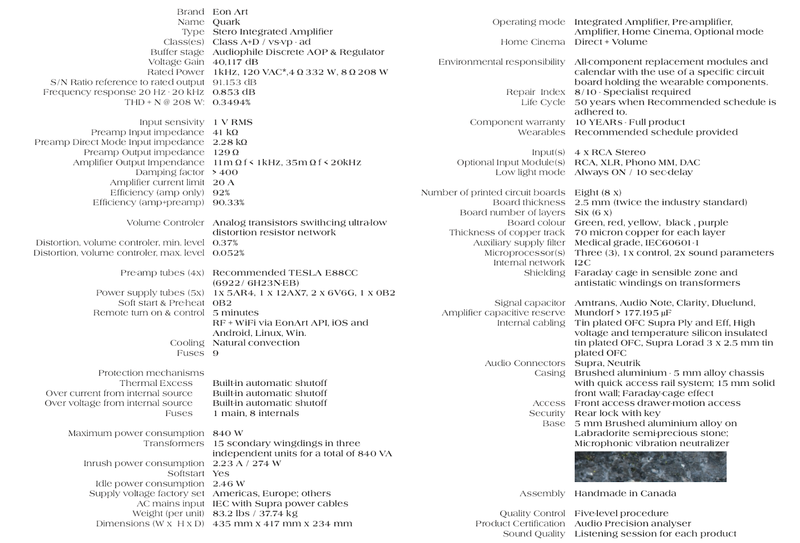 The conclusion of nine years of research was the Quark 208W Integrated Amplifier in 2018. 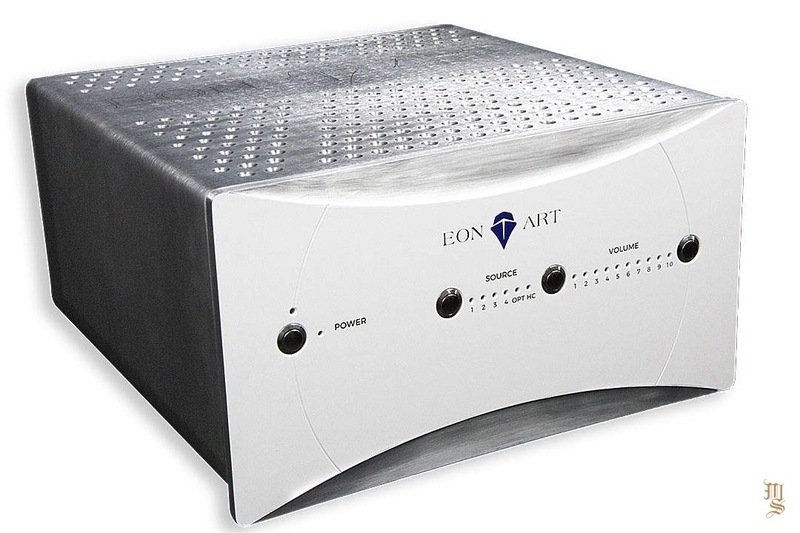 Eon Art Canada Inc is the merger of Eon Art Haute Fidélité of Canada and Venus Acous- tic of France, a company founded by Nicolas Dutrieux, highly specialized in sound geometrics in the production of HiFi tall speakers. The company is currently based in Chandler, QC, Canada and in partnership with a marine electronics integration company, Ocean Marine. Eon Art amplifiers only uses proven, tested technologies in its systems, including some from the medical and jet fighter worlds. 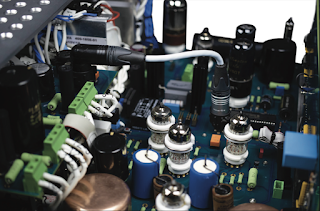 Our circuit boards are constantly being reviewed by computer simulation, our systems analysed with Audio Precision and each unit is tested in our listening room before final inspections and commissioning. Experience unique musical emotions through a master- piece of computer science. Ample power at all ranges with a warm and soft output. Not only is this amplifier unique, it is revolutionary from a durability and environmental standpoint. It has the longest warranty in its class, and the team to support it. 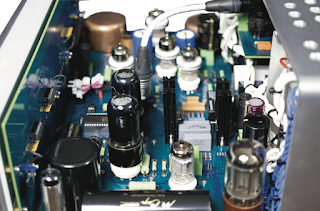 Capacitors used on the path of the audio signal are all audiophile-quality and bear the marks of suppliers of the likes of Amtrans, Clarity, Duelund, Lefson and Mundorf. Those used in the most sensitive places are armored. We have ensured that their quantity is adjusted to make no phase rotation and to use multi- ple complementary models with a different sound signature so as not to exacerbate it. We thus avoid the usual problems with the use of capacitors and guarantee the utmost neutrality of their action on the music. In 2018, Eon Art Canada is the only amplifier design firm that has succeeded in producing an architecture that is optimized for its select- ed components. Computer simulation assist- ed design allows us to optimize the value and choice of components. This results in a sound tube, that is to say with details, image, and emotions without being limited to high output- loudspeakers that would otherwise be need- ed. The available power of the Quark is one of its unique assets making it ideal for tallspeak- ers that are known to have a difficult behaviour. The volume intensity of the amplifier is controlled by a set of thin metal film resistors that are high stability, high precision and medical grade selected by transistors. The complete absence of relay and mechanical potentiometer, as well as the circuit topology, guarantees a lower rate of distortion than almost all of the competitor volume controllers, all without any mechanical wear. After its components are soldered each circuit board undergoes rigorous automated testing using specific computer analyzers. The devices are then tested for endurance and stability for twenty-four hours at full power under the eye of a 64-channel M300 acquisition center. An Audio Accuracy Analyzer is used to prove that each amplifier reproduces complex musical signals according to the ultra-restrictions we have selected and the most rigorous standards in the industry. Both the steps of the assembly and the qualitative process are documented and signed off by the various stakeholders on a certificate to that will be supplied to the owner as a reference."